Creamy yet light and nourishing. 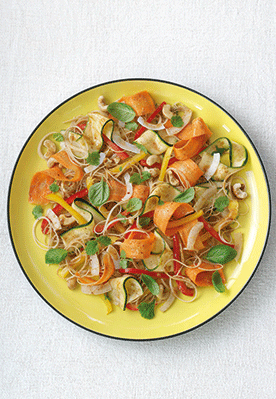 Adding kelp noodles provides additional texture and minerals to support metabolism. 1. To make the nut sauce simply blend all the ingredients together adding enough water to create a thick dressing. 2. Place all the ingredients for the salad in a large bowl and stir through the nut sauce. Sprinkle over the sprouted seeds or beans to serve.